Plants bushy, with obvious main axis, up to 5 cm tall, repeatedly branched, often laterals in part distichously arranged, in part polystichously. Main axis without cortication in younger parts (up to about 100 µm in diameter), the cells 1-2 times longer than broad; older parts of the main axis with a dense cortication of rhizoidal filaments originating from proximal cells of the laterals, increasing the axis diameter to 250 µm. Ultimate branch system roughly pinnate, ramuli straight, not overtopping the thallus apex; terminal cells blunt or tapered. Tetrasporangia in adaxial series on ultimate ramuli; one sporangium per cell, sessile, nearly globose, ca. 75 µm in diameter. Spermatangial heads pyramidal, with a ca. 5-celled central axis. Carposporophytes with rounded twin gonimolobes. Collections, ecology and regional distribution. A species of the upper intertidal zone, mixed with Bostrychia intricata. Recorded along the whole west coast as far east as Dwesa (1-44). World distribution: widespread in the Atlantic, also recorded from Namibia and Chile (Guiry & Guiry 2015). Type locality: Moray, Scotland (Dixon & Price 1981 in Guiry & Guiry 2015). Callithamnion hookeri, detail of older axis with determinate laterals. (Reproduced from Stegenga et al. 1997). M.D. Guiry in Guiry, M.D. & Guiry, G.M. 2015. AlgaeBase. World-wide electronic publication, National University of Ireland, Galway. http://www.algaebase.org; searched on 07 September 2015. Gray, S.F. 1821. A natural arrangement of British plants, according to their relations to each other, as pointed out by Jussieu, De Candolle, Brown, &c. including those cultivated for use; with an introduction to botany, in which the terms newly introduced are explained; illustrated by figures. pp. vol. 1: [i]-xxviii, - 824, pls I-XXI plates. London: Printed for Baldwin, Cradock & Joy, Paternoster-Row. Stegenga, H., Bolton, J.J. &R. J. Anderson. 1997. 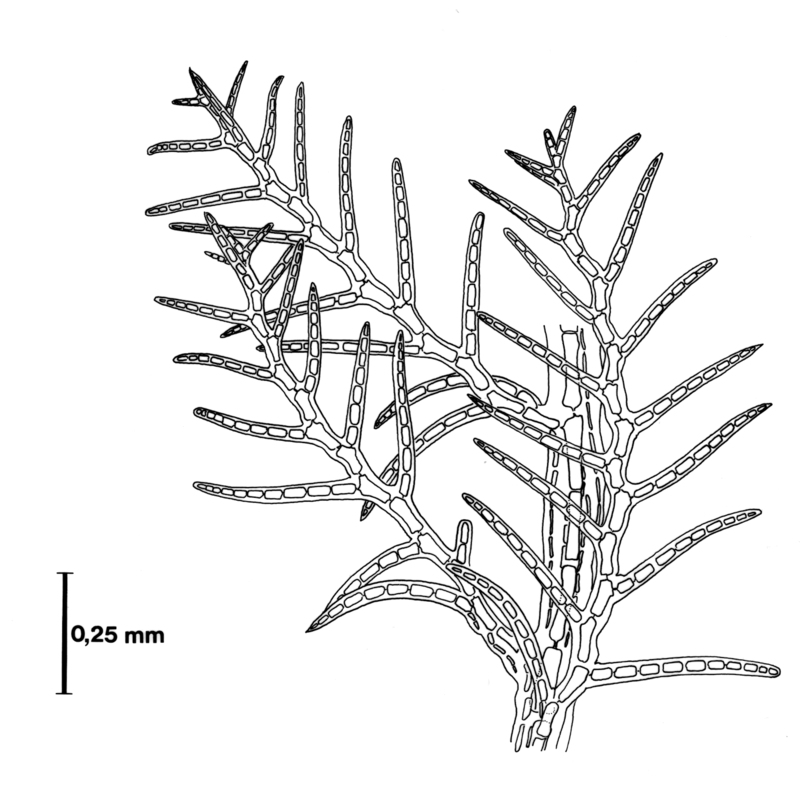 Seaweeds of the South African west coast. Contributions from the Bolus Herbarium 18: 655 pp.